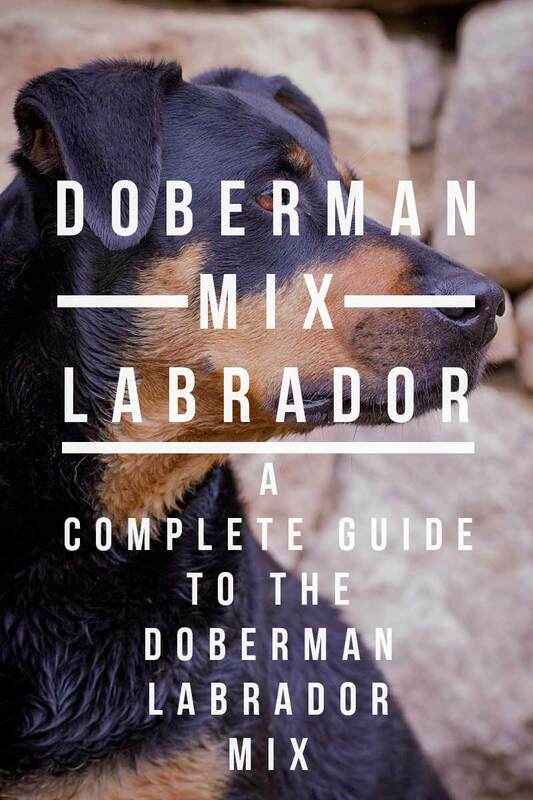 Welcome To Your Complete Guide To The Doberman Lab Mix Dog! From Temperament To Care, Exercise To Training And Health. Everything You Need To Know About This Unique Combination. The “Doberdor,” is a cross between the Doberman Pinscher and the Labrador Retriever. Two breeds which are commonly perceived to be on opposite ends of the spectrum in terms of their personalities! Dobermans can be extremely loyal and protective. Making them popular guard dogs. Although when they are properly socialized from an early age, they can be lovely family dogs. Labradors tend to be very friendly to everyone, happily welcoming friends, neighbors and potential burglars alike into the family home. It’s likely that when a well-trained Doberman is crossed with a Lab, the resulting offspring will be large dogs that have endless energy and a love for play. But their personalities can differ a great deal. 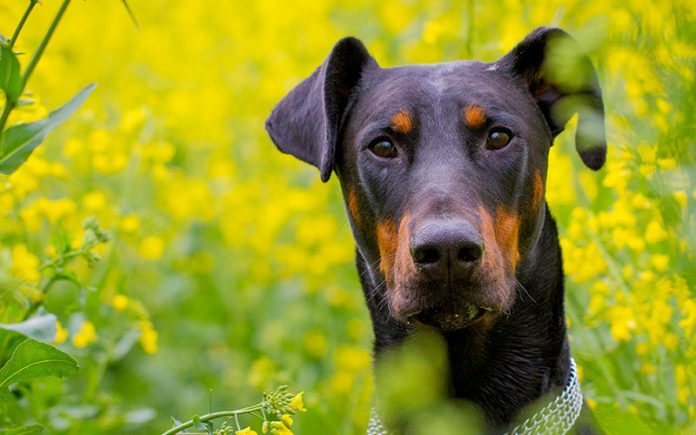 In this article, we’ll discuss more of the traits that you can expect in a Doberdor, and the history of the parent breeds. We’ll look at expected general appearance and behavior, as well as possible health issues. Giving you this information and more, on what’s needed to make the Doberman Pinscher Lab mix a family pet. What is a Doberman and Lab mix? A Doberman crossed with a Labrador is a hybrid “designer” breed that results from crossing a purebred Doberman Pinscher with a purebred Labrador Retriever. This mixed breed combines one of the world’s most popular family dogs with a dog that’s unfortunately notorious for aggression and lack of suitability as a pet. We’ll get into why this notion shouldn’t be applied to every Doberman in a later section. For now, let’s talk about the Doberman x Labrador’s heritage. Where did the Doberman and Labrador mix come from? Like any mixed breed, the Doberman Lab Mix’s history can be traced to its parent breeds and their origins. The Labrador Retriever breed was first developed in Newfoundland, Canada. Where smaller water-fowl hunting dogs were mated with Newfoundlands. The Lab was recognized by the American Kennel Club (AKC) as a sporting breed in 1917. Today’s Labradors are still used as hunting dogs, but they’re also found in the line of service. You can also find many a Lab in family homes, where they are much beloved pets. The Doberman Pinscher was first bred in Germany during the late 1800s by a tax collector named Louis Dobermann. Mr. Dobermann was in need of a dog that would make a fierce protector when needed, but would otherwise make a lovely companion. To develop this type of dog, short-haired Shepherd-type dogs were bred with Rottweilers, black and tan terriers, and German Pinschers. Until the Doberman Pinscher that we know today was finally perfected. The AKC recognized the Doberman Pinscher as a working breed in 1900. The Doberman’s role today has expanded from his original use as a guard dog to search and rescue, agility and obedience competition, service and police work, tracking and hunting. Even military work! These are both intelligent, hard working breeds. Because he is a hybrid dog, the Doberman Lab’s temperament can be hard to predict. It’s truly a toss-up with every mixed breed puppy. You can increase the odds of a favorable temperament by breeding or selecting from parent stock whose personalities closely match what you’re looking for. Doberman Pinschers have long been viewed as dangerous dogs. It’s thought that they aren’t suited for homes with children or small animals. This is due to the early Doberman’s sharpness and quickness to bite. Fortunately, this “bite first, think later” temperament has been gradually gentled through generations of breeding. While most Dobermans are no longer bred with such aggression in mind, it’s important to note that every Doberman is different… Just like every other dog breed. Some Dobermans may have a more severe temperament than others. Additionally, Dobermans do not take well to being caged for long periods of time. They do not do well with isolation at all. Labradors also have a tendency to get bored and destructive if left alone for lengthy periods. These breeds are not advised if you work away from home during the day. If you plan to get a Doberdor, you might like to have two of them. Or maybe another pet that you know your Doberman Lab mix gets along with. It’s recommended that you only keep one male Doberman in a single household, as they can become territorial and aggressive toward each other. It’s vitally important that you socialize your pup with other dogs, places, and humans. This is to help prevent territorial and/or aggressive behavior. It’s also important that you begin obedience training at as early of an age as possible. You can’t know how they will turn out temperament wise, so all Doberman Lab mix pups should be given this thorough socialization. All of these precautions should help reduce their need to guard their property or family from people or other pets. 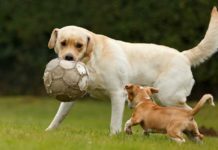 While most Labrador Retrievers aren’t particularly territorial, they tend to be excitable and can be a bit too “in your face” for some people’s liking. As the Doberman Lab tends to be a good-sized dog, some people may find one that likes to jump a bit intimidating. For your guests’ as well as your own benefit, you may need to work on a Doberdor’s obedience training. Ideally so that he won’t jump and will sit when guests arrive and he’s not crated. Since Labradors are, well, retrievers, a Doberman Lab mix may let his nose get him into trouble once he’s on a scent. Or once he spies something that resembles a bird or squirrel! A great recall is essential. Until you have this a Doberman Lab mix would greatly benefit from a fenced-in yard. This way they can play, be trained and exercise risk free. Let’s say that you will have your pick of chocolate Lab Doberman mix puppies once they’re born. What color can you expect them to be? 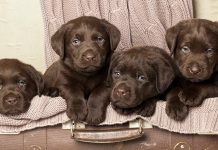 As their name suggests, chocolate Lab-Doberman puppies could come out chocolate brown, like their chocolate Lab parent, or they could come out looking more like a Doberman. There’s also the possibility that they could be some mix of both parents’ colors. Generally, Doberdors may be solid-colored like a Lab, or they may be bicolored like a Doberman. A Lab Doberman mix puppy will have a short coat. This is because both the Labrador and the Doberman Pinscher have short coats. Additionally, because the Lab has a double coat, some Doberdors may also inherit a double coat. It’s important to note that if a Doberman Lab mix has the short and fine coat of a Doberman Pinscher, then he may not be suitable for a home in a cold climate unless he has a doggy coat or vest. A dense double coat will require weekly brushing. But if he inherited the Doberman’s thin and shiny coat, then a Doberman Labrador mix would benefit from occasional grooming. You probably won’t know which until your pup is a little older. 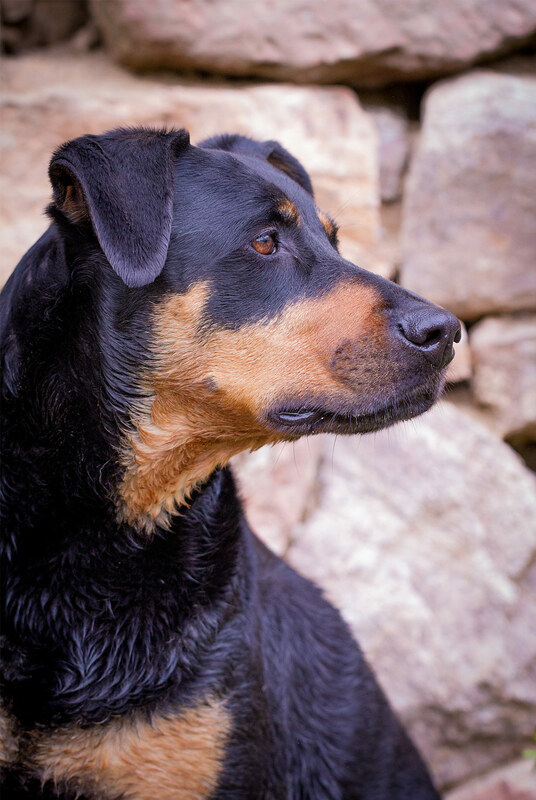 Like any purebred or mixed breed, Doberman Lab crosses may develop health problems. These can be associated with age, or they may be prone to certain health conditions due to genetics. A few common canine ailments that are common across breeds. These include hip dysplasia, eye diseases, allergies, and skin irritations. However, hybrids like Doberman Labrador mixes may inherit the health conditions that are common in their parent breeds. For Doberman Lab mixes, both Dobermans and Labs are prone to hip dysplasia and progressive retinol atrophy (gradual vision loss). Hip and elbow dysplasia are the main ones to be aware of. 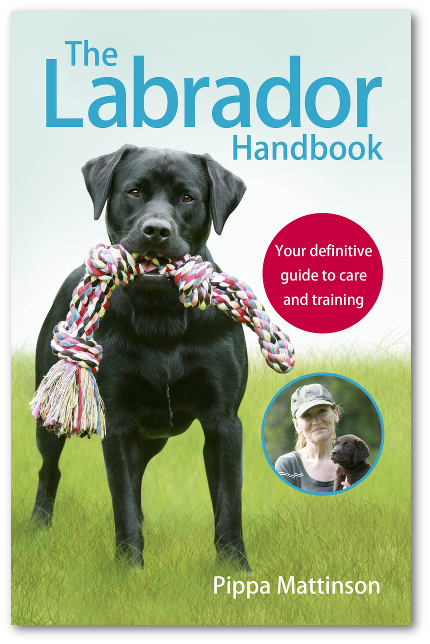 The Labrador parent must have low hip and elbow scores before being bred from. 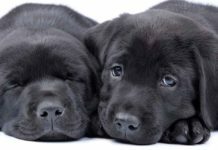 To learn more about the diseases and health conditions that have been associated with the Labrador breed, specially, refer to our article on Labrador Retrievers’ Health. Doberdors are also susceptible to a host of other health problems that may be passed on from their Doberman parent. Dilated Cardiomyopathy – Between 45 and 63% of Dobermans in the United States and Canada develop dilated cardiomyopathy. A disease which is believed to be genetic in many large dog breeds. The disease results in an enlarged heart and eventually heart failure. Hypothyroidism – This is a condition of the thyroid that results in decreased metabolism and weight gain. With some experiencing issues with hair loss and/or dry skin. Bloat – Dogs with deep and narrow chests are more likely to develop this potentially fatal condition. 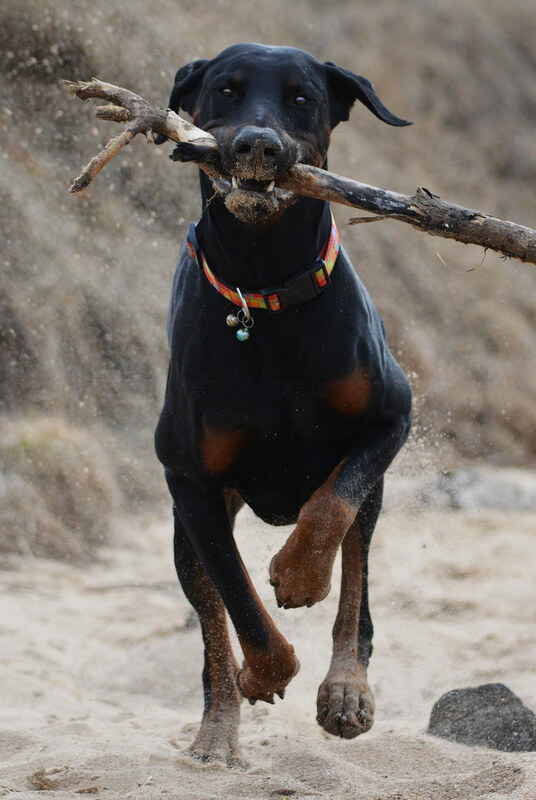 Wobbler syndrome – Roughly 50% of instances of Wobbler syndrome are found in Dobermans. Von Willebrand’s disease – This condition is common in Dobermans and can be diagnosed via genetic testing. The Doberman parent should have had this test. Hepatitis – Dobermans are unfortunately prone to developing chronic liver disease once they reach middle age. Routine blood screenings from an early age will help to diagnose this condition before physical signs are apparent. If you’re working with a breeder to obtain a puppy, be sure that they test their parent stock to determine any inherited health conditions they may pass on to their offspring. Furthermore, make sure that both parents have good hip and elbow scores, clear PRA tests, recent clear eye tests and the Doberman parent is clear for Von Wilebrand’s Disease. Doberman Lab mix have a tendency to develop hip dysplasia coupled along with an energetic nature. You absolutely will need an exercise plan for one of these active and playful fur babies. Exercise is especially important if your Doberman Lab takes after his Lab parent in the weight category, as he may easily gain too much weight without adequate exercise. We recommend that you have time for at least one walk per day and plenty of room for your pooch to self-exercise when you’re gone and to play in when you’re home, be that in the house or a fenced-in yard. Your pup will be even happier if he gets to stretch his legs at the dog park every so often! How long do Lab and Doberman mixes live? Hybrid dogs generally have the same life expectancy as their parent breeds. So, a Doberman Lab mix has an estimated life expectancy of 10 to 12 years. 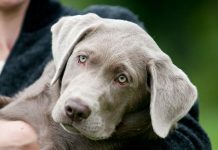 Since many breeders focus on perfecting purebred dogs, it may be more feasible to find a mixed breed for adoption at a local shelter or perhaps a Doberman Lab cross rescue. This may be especially true for the Doberman Lab mix, as this designer breed appears to be somewhat rare. You may be hard-pressed to find a breeder without doing an extensive amount of research. 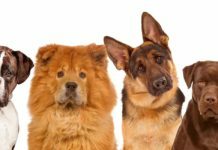 Most designer breeds are at least a few hundred dollars, but the exact amount that you’ll pay varies based on the particular breeder’s stock and how much they place on their dogs. Is a Doberman Labrador mix a good family dog? 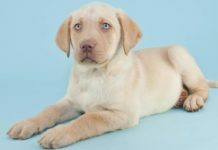 You’ll want to consider a few key points before making the decision to purchase a Doberman Labrador mix puppy. Both Doberman Pinschers and Labrador Retrievers are larger breeds, so their offspring will definitely be too large to live comfortably in a small apartment or in a cage for hours on end. People who will not be able to handle a large dog should not consider this breed. You also should not consider this breed if your dog will be kept by himself, as dogs with Doberman blood do not do well with isolation. Additionally, the breed’s Labrador lineage may lead it astray if your yard is not fenced in, as he may cut to the chase if he spots a squirrel or rabbit! Should I get a Doberman Lab mix? The good news is that you shouldn’t have to worry about a lot of grooming – even if a Doberdor has the double coat of its Lab parent, it will require weekly grooming, at most. You’ll be quite lucky in the grooming department if you find a Doberman Lab mix with the Doberman’s thin and shiny coat. As with any dog, mixed or not, you must also be prepared to deal with any ailments that come with the breed or breeds, especially hip dysplasia and loss of eyesight, in this case. There are a host of other inherited conditions that a Doberman Lab mix may develop, so we also recommend genetic testing of breeding stock before you purchase a puppy. Last but certainly not least, socialization and obedience training from a young age is necessary for Doberman Lab mixes, as they may inherit the Doberman’s guarding tendencies or the Lab’s over excitable nature. Both of these personality types can be handled with proper training. Wess, G.; Schulze, A.; Butz, V.; Simak, J.; Killich, M.; Keller, L.J.M. ; Maeurer, J.; Hartmann, K. “Prevalence of Dilated Cardiomyopathy in Doberman Pinschers in Various Age Groups,” Journal of Veterinary Internal Medicine, 2010. We just lost our dobie lab mix, could not have asked for a better dog. He never met a stranger, loved everyone he met. I got him as a free to good home & it was the best thing I ever did. Buck was imperfectly perfect, his only flaw was he had separation anxiety. The door knobs were his enemy, he chewed both the front door & the one going to the garage because these were the ways we left the house. Other than that, never chewed anything. He was my cuddle bug, loved being hugged & loved on. He did have a bit of dominant streak, but was never a mean dog, just a little stubborn. A perfect mix of the doberman and lab personalities and a very handsome boy as well. Our hearts are still broken. How I’d love to find another Bucker Boo. Found a Doberdor abandoned on the side of the road at 6 weeks old. Being a young 19 year old that has always wanted a large breed dog I took him in and he has quickly become the most loved member of my family. He was potty trained by 12 weeks and knows sit, stay, come, lay down, paw, and more by 16 weeks. Incredibly smart dog breed, definitely high energy and super sociable. Anyone that has the means to take care of this breed, I suggest getting one. You won’t regret it. We have a almost 3 year old deep brown/black male doberlab. Very sweet and protectful of us and our house. He still needs to work on socialization with some types of dogs and playful with others. He was a rescue/adoption dog who was in shelter for approximately a week wedont know if he had siblings. He does have some anxiety issues with loud sounds. A very food motivated dog. We love “Groot” to death. He’s gone from 65 lbs to 88 lbs. I had a Doberman / Lab cross for almost 14 years and would like to purchase another. Can anyone tell me where in Victoria can I buy one. for a pillow. She loves everyone and everything except groundhogs (She was bitten). Where can I find me one? We have a sweet 10 yr old female black doberdor. We rescued her at 4 months old & trained her our selves. She is the best dog we have ever had! Loyal, obedient, gentle & loving. Lots of puppy playfulness left in her!